Tanah Lot - one of the popular interesting temple and located in the west of Bali (Tabanan Regency).The most visitors come to Tanah Lot every time for sunset so this place deemed icon of Bali. The land (Temple) in the middle of the sea visible like floating, when the tide is high.But If the tide is low all of tourist can walk and visit this place close by. After observe and enjoy the sunset time at Tanah Lot ( Package A), the tour will continue going to spa treatment and Balinese massage ( Package B).The program spa will take approximately 2 hours like flower bath, body scrub, aromatic foot wash,Balinese massage with all of experience therapists. 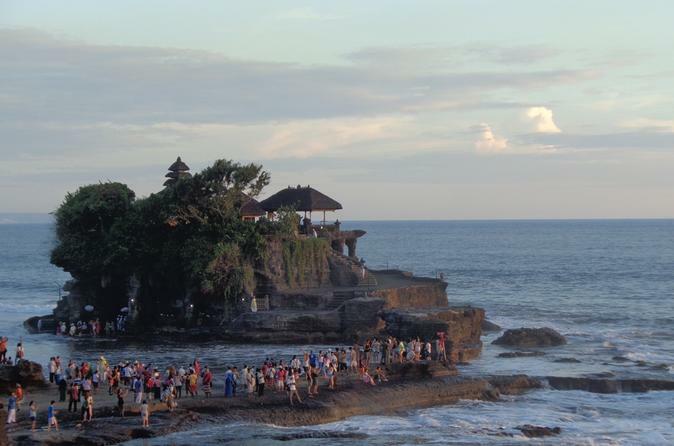 You will be picked up from your Bali hotel and start your tour to Tanah Lot Temple for sunset. This temple is located in the middle of the sea and look like floating in the sea when the tide is high. Once the tide is low the visitor can walk really close to this temple,and there are some good spots for taking photos or generally for pre wedding.The temple is used for praying to the God of Sea by local people and the tourist can also participate asking to be blessed to be part of this.There is a cave in front of this temple inhabit by holly snake, history local legend the snake is guarding this area of temple all the time,the people can not disturb the snake according to belief. After visiting the amazing Tanah Lot Temple tour finished, you will be transferred to enjoy the spa treatment (Package B ) with any kind of treatment Balinese Massage doing by experience therapists. This session consists of 1 hours Balinese Massage then the rest time 1 hour will treat foot bath flower, flower bath, body scrub, yogurt body polish,and shower,so totally 2 hours Bali Treatment. You will be escorted and dropped off to your Bali hotel. If you request to be dropped off at any other places such as mall or restaurant please feel free to ask the driver.